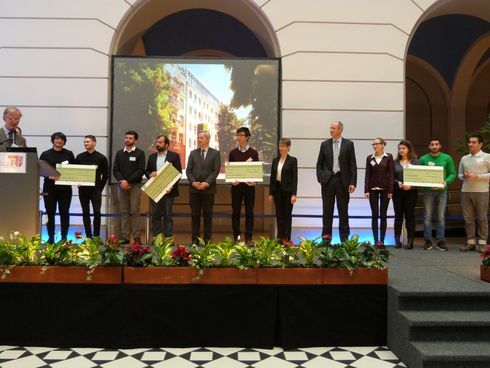 The annual CKI Idea Contest took place from October 19th until December 7th 2015. With a total of 70 ideas showing how digitalization can enhance our city and nearly 200 comments it displayed the creative potential of the TU Berlin. The contest took place on an online innovation platform and was open to students and researchers from TU Berlin. After 6 weeks of ideation 10 Finalist ideas were selected and invited to the final day where they pitched to an expert jury. The jury then selected the 4 winning ideas. The four winning teams pitched their ideas at the CKI Conference 2015. In the audience where, amongst professionals from Siemens AG, professors, students and other guests, the contest sponsors: Siemens managing board member Dr. Roland Roland Busch, TU president Prof. Christian Thomsen and city council representative Barbara Berninger who together honored the teams with a prize of 1000€ each. The CKI thanks all participants, the jury and the sponsors!